Movie Review: Ambitious Quebecois filmmaker Xavier Dolan, directly associated with queer cinema (“I Killed my Mother”, “Heartbeats”, “Laurence Anyways”), has in “Tom at the Farm” his first exercise on thriller with mixed results. It’s undeniable that Dolan is a very talented man, considering that he also stars as the main character (not a novelty) and was responsible for the adaptation of Michel Marc Bouchard’s novel, production and editing. The issue is that the good and the bad alternate constantly. While some scenes were capable to surprise or even intrigue me, other seemed completely forced and unbalanced. Coming from Montreal, Tom arrives at a farm in the countryside to attend to the funeral of his lover, Guillaume. For his surprise, Gullaume’s mother, Agathe, wasn’t aware of his son’s sexual orientation, while his frustrated brother, Francis, tries everything to show who’s the boss around, making Tom extremely uncomfortable. Entering in a dangerous game that was much defiant and abusive, Francis, shows a sort of perversion difficult to decipher, while Tom acts like a scared sensible child. To complicate more the situation, Sarah, the woman who the family always thought to be Guillaume’s girlfriend, arrives at the farm. 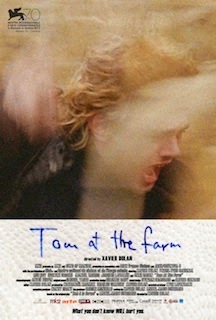 With a keen photography and not rare big close-ups to penetrate in the characters’ innermost souls, “Tom at the Farm” is a tragicomic thriller that still may have something to be enjoyed, despite the flaws and lack of a real climax.